It’s 2011 the beginning of a New Year and time to start at the beginning for Bijouxs Basics. The #1 Bijouxs Basics kitchen equipment nomination goes to the humble cast iron skillet, it can handle almost any cooking task, it’s steady and sure – a Bijouxs you can count for a lifetime. 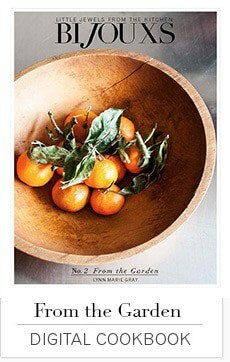 If there every were a time for getting back to basics, we all can pretty much agree 2011 is a prefect year to think basic. And since Bijouxs is built on the premise of bringing you the little jewels for you kitchen, here is a real kitchen diamond in the rough. Cast iron, can you get anymore basic? Beneath the simple, humble and somewhat “rough around the edges” appearance of a cast iron skillet, lies a cooking partner that produces food that is loaded with style and cooked to perfection. 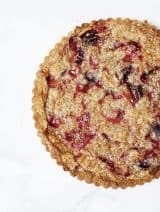 What one pan can sear a steak to Philadelphia Style perfection, produce Nebraska fried chicken and gravy that will make you weep, caramelize a Tarte Tatin to golden perfection, bake a delicate Cherry Calfouti, or take a simple Shepard’s Pie (pictured) from stovetop to oven – you know. I have had my cast iron skillet for a hundred years, well, as long as I have been cooking, and can’t think of life in the kitchen without my trusted skillet. 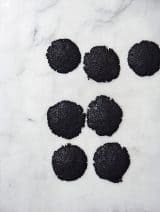 A cast iron skillet wears like cast iron because it is cast iron, and is a prefect budget- friendly Bijouxs Basics you will use time and time again. Lodge is one maker of the classic cast iron skillet, offering a generous selection of sizes and shapes and now they offer cast iron that is seasoned, more on that later. My local hardware store still carries Lodge cast iron skillets – now that’s basic. As far as the size you should consider for purchase, if it’s your first skillet you might want to opt for a size you can use everyday – yielding about 4-6 servings. My everyday pan pictured is a 10-inch skillet. 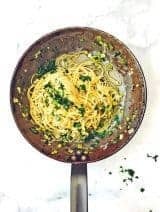 If you often feed large crowds, you may consider a second skillet versus one very large skillet, as cast iron is heavy and can become difficult to wield around the kitchen. Now for the care and feeding of your new cast iron skillet. Lodge has some simple and useful information about caring for cast iron. Most of the new cast iron pieces come already seasoned, which means they are ready for you to use. I still prefer to season new cast iron once before I use it. To season, preheat the oven to 300°, spread a light coating of solid white Crisco vegetable shortening inside and outside of the cast iron, covering all the areas. Place the pan upside down on a rack in the oven and place a baking sheet lined with foil on the rack below to catch any oil that may drip. Bake in the oven for about 1 hour. Turn off the heat and allow the pan to cool in the oven, then you are ready to go. 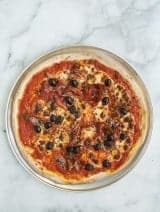 You may want to repeat this seasoning procedure if food begins to stick, or after you have done a deep cleaning on the pan, which you may need to do from time to time. Lodge has easy instructions for these procedures as well. My love of cast iron of course has lead to the purchase of other cast iron cookware in addition to my beloved skillet. Another highly functional cast iron piece is my grand Dutch oven, and a treasured vintage corn stick pan given to me by a friend’s Mother so I could properly prepare her toothsome corn stick recipe. 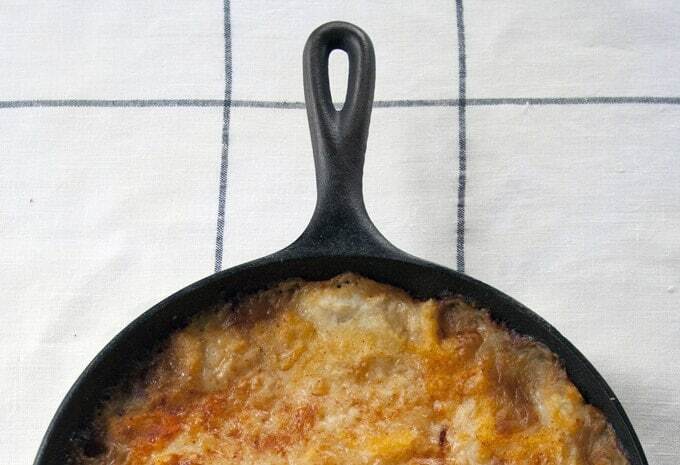 I could not just leave you with a picture of my empty skillet, so I am sharing a humble, yet tasty Shepard’s Pie recipe, a perfect supper in these cold first days of January, and wonderfully prepared in my favorite cast iron skillet. Bijouxs Basics cast iron skillet: makes perfect meals and makes perfect sense in 2011. P.S. 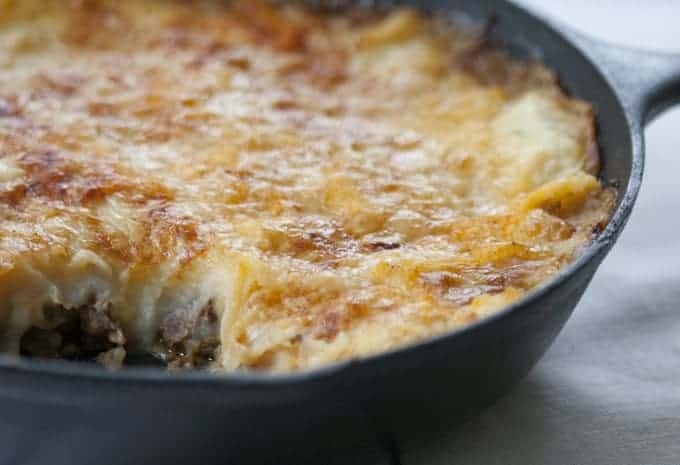 The Shepard’s Pie recipe calls for Sauce Espagnole (Brown Sauce) which is one of the classic French base sauces that is very useful to have on hand. 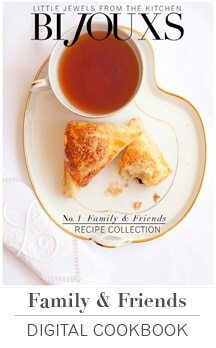 The recipe will be in the Bijouxs Cookbook – stay tuned – but I have provided some alternates in the recipe. What a great idea! It never occurred to me to put everything in my cast iron skillet. This looks yummy! Can’t wait to try! Maybe you will share the recipe with Bijouxs? Great idea for the cast iron skillet! Thanks for being a part of Bijouxs Beth!